This video up above shows you step-by-step how to do it. 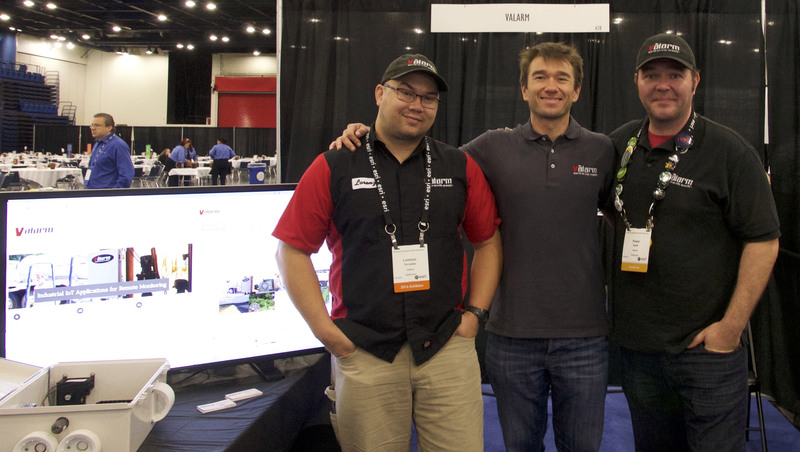 Harness the power of Industrial IoT + GIS! Note: If you prefer text-based HowTo tutorials then have a look at this write-up on Valarm integration with ArcGIS.com. On Shop.Valarm.net you’ve got sensor hubs (like GSM 3G and WiFi) and industrial sensors for your remote monitoring deployments with Tools.Valarm.net. Please don’t hesitate to contact us with any questions at info@Valarm.net. Who uses this Industrial IoT stuff? Also see how our customers use Webpage Dashboards for Remote Sensor Monitoring, Telemetry, and Industrial IoT solutions. Howdy! This is Edward Pultar from Valarm. You’ll learn in this video how to link your Esri ArcGIS Online account to Valarm Tools Cloud so you can combine the power of GIS with Industrial IoT and remote sensor monitoring. First up you’ll log in to your account at Tools.Valarm.net. Then click Esri ArcGIS Tools in the top menu. On the left under ArcGIS Tools you’ll see a link you can click to log in to your www.ArcGIS.com account. Click the link and you’ll see the Esri ArcGIS Online authentication screen. Here you’ll enter your username and password info you use to access ArcGIS.com. After you’ve entered your ArcGIS Online credentials you’ll see a confirmation on Valarm Tools Cloud, under your account settings, that confirms you’re currently authenticated with your ArcGIS.com account. Now let’s load a map layer from Esri ArcGIS Online. We’ll combine GIS with Industrial IoT information from Valarm remote sensor monitoring devices. Set a time range of from and to dates for which you want to load your GPS-tagged Valarm sensor device data. Under ArcGIS Tools you’ll see a button that allows you to load a web map from ArcGIS.com. Click this button so you can add a web map by ID. To get the Web Map Resource Identifier go to your GIS layer on www.ArcGIS.com. Here’s we’ve got an example GIS layer with California Fires and NOAA Weather Stations. On the overview screen highlight and then copy the id text from the URL in your web browser. Now paste that web map resources identifier into the text field on Tools.Valarm.net and click load. That’s it! You now know how to load your ArcGIS Online layers on Valarm Tools Cloud. 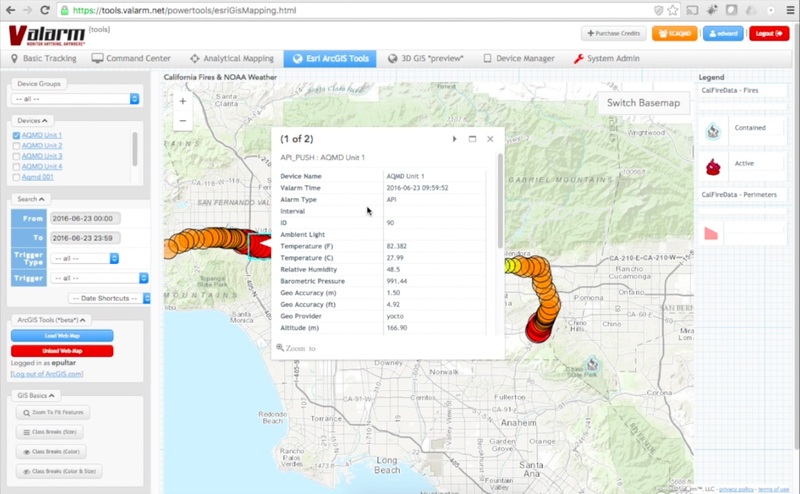 Here the California Fires and NOAA Weather Stations layer has been loaded and you can click any of the GIS layer points to get more information about that ArcGIS.com web map feature. On the right side of the screen you see the Map Legend has been loaded. In this layer we’ve got 2 types of wild fires – contained fires that are visualized with a white fire point icon, and active fires that are red. Now let’s combine your ArcGIS online web map data with Industrial IoT, or IIoT, sensor information from Valarm sensor hub devices. Select your Valarm sensor hubs you’d like to add to the map. In this case we’ll add a Valarm unit that was made for SC – AQMD, an Air Quality Management District, which is responsible for air quality monitoring and compliance in Southern California. This GPS-tagged data is from a Valarm box that monitors particulate matter like PM1, PM2.5, and PM10, as well as specific gases like NO2 (Nitrogen Dioxide), O3 (Ozone), and H2S (Hydrogen Sulfide). This is done using Alphasense sensors and a 3G GSM Sensor Hub. 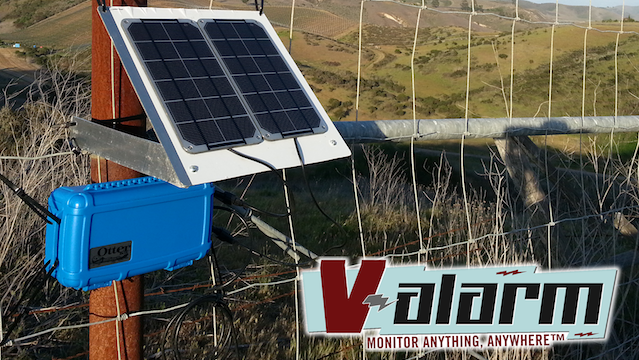 See our Customer Stories and Blogs on www.Valarm.net for more info, pictures, and videos on automated, remote air quality monitoring. You can see that the Valarm IIoT sensor information loads on top of your ArcGIS Online GIS layer. All of the Valarm sensor data collection points are clickable and show you full information about that data collection point. With these Valarm units that includes temperature, humidity, pressure, latitude, longitude, ozone (O3), and nitrogen dioxide (NO2). Use the other Valarm Tools like Class Breaks by Color and Size to quickly and easily spot hot spots for what your real-time sensors are monitoring. Now you’ve got all the info you need to get started with your GIS + Industrial IoT needs by linking your Esri ArcGIS Online account with Valarm Tools Cloud. We’ll be adding more Esri ArcGIS.com features to Tools.Valarm.net so keep an eye on our blog at www.Valarm.net/blog for the latest stories. If you’ve got a feature request or have any other questions then please don’t hesitate to contact us at info@valarm.net. Thank you for watching!